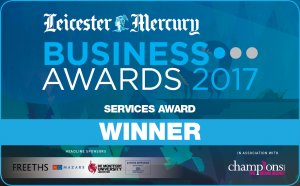 Checkprint, part of the TALL Group of Companies, the UK leader in the provision of secure paper and electronic payment solutions, is celebrating after the Hinckley-based company triumphed at the Leicester Mercury Business Awards 2017 last week (Thursday 27th April). The firm fought off tough competition to secure the Services Award after demonstrating strengths in service excellence, business growth, innovation, technology, training and personal development. Checkprint also received special praise from Martin Atkinson, Sales Director at Towergate Insurance, who sponsored and judged the award, for what the company has achieved in what continues to be a challenging environment for the payments industry. A team of nine employees from Checkprint, led by Managing Director Martin Ruda, were on hand to celebrate as the company received the prestigious award. In total, more than 750 guests from across various industries headed to the Leicester Arena for the gala dinner and ceremony, which was hosted by broadcaster and comedian Mark Dolan, alongside ITV Weather presenter Emma Jesson. 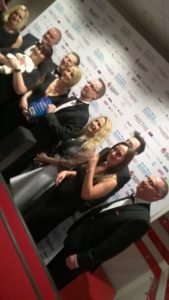 Commenting on the award, Martin Ruda said: “This success is testimony to the hard work, enthusiasm and commitment displayed by each member of the Checkprint team. The Leicester Mercury Business Awards is a fantastic initiative that celebrates best practice across a vibrant area of the UK, and we are thrilled to have our achievements recognised by a panel of esteemed judges.